Last chance: We only have 28 left - This product will not be available again once our stock runs out. Buy 1 for $2.13Buy 2 / Save $0.11!Buy 3 / Save $0.43! Size (inches): 9.84" X 5.91" X 0.39"
Do all you can to protect your precious baby when your travelling in the car. 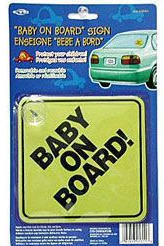 The "Baby On Board" sign may alert the drivers behind you to proceed just a little more cautiously! The sign is a very inexpensive investment in something so priceless. The sign features a standard suction cup fastener to ensure that it stays in place whenever you choose to display it in the rear window your car.